New for 2018 the new M-series combines market leading technology with design lead style resulting in a range of e-bikes that set new standards and raises the bar to a new level. 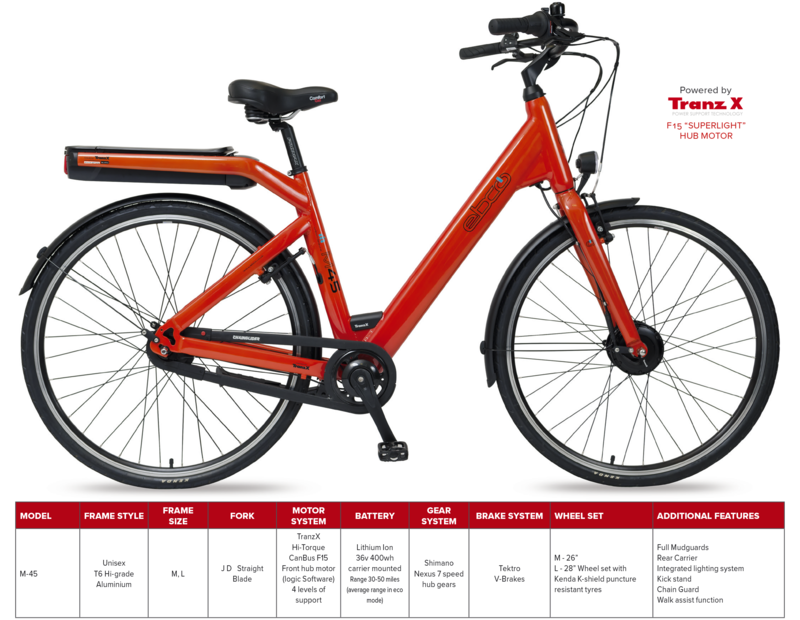 The M-45 uses a unique unisex T6 alloy stylised frame with an integrated battery/rear rack that houses the 36v 400wh battery giving a range of 30 -50 miles. e-power comes from the TranzX F-15 almost silent hi-torque front hub motor incorporating CanBus/Logix computer diagnostic capability which gives more efficient and accurate information for your EBCO service dealer. Highlight feature is the Shimano 7 Speed maintenance free internal hub gear system. Packed with a full list of kit Featuring , Tektro V brakes, Kenda K Puncture shield tyres, Comfort saddle and integrated lighting system. Available in unisex frame style. Sizes:- M.L. and finished in Gloss Tangerine. Style meets class leading function.